When considering whether to go with a Mac or PC to run your business it all depends on your personal preference really, and the majority of people tend to feel passionately about it either way. The great thing about Bugbase termite and pest software is that even though it is a Windows program there is a way to run it on a Mac computer. This is important information if you own a pest or termite company and are considering what kind of computers to use for managing your business. You may think that because the majority of the programs you know you will be using every day are Windows that you only have one option: PC. However, with today’s technology, you do not have to feel so limited. 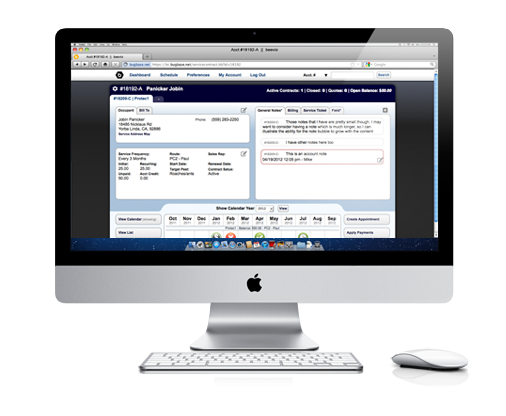 Among the numerous software solutions to running Windows on a Mac, we recommend Parallels. 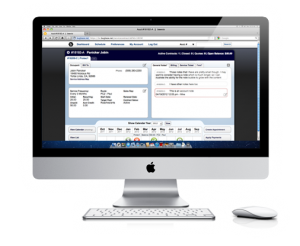 This software is unique in that it enables you to use Mac and Windows applications at the same time rather than having to keep rebooting your computer to switch back and forth between operating systems. So, Mac lovers, rejoice! Parallels Desktop for Mac is selling for about $80 right now which is a pretty sweet deal for getting the ease and convenience of both worlds, PC and Mac, coexisting and collaborating seamlessly together. Just think, now you can use Bugbase and virtually any other Windows programs, on your Mac! Even if you wanted to have just one Mac computer in the office and the rest be PCs that is now a valid option. Bugbase is California’s #1 termite report writer and we are glad to say that it can be run on any Windows computer as well as any Mac with the help of Parallels. Right now we are offering 30 day FREE trials for new company signups and our service includes free installation, personalized tech support, and backup service. If you have been looking for a termite report writer that doesn’t make you want to pull your hair out on a daily basis, you need to try Bugbase and keep yourself from going bald! Just visit our website at the link below and check out our real customer testimonials for yourself. Signing up is easy and free, so what have you got to lose? 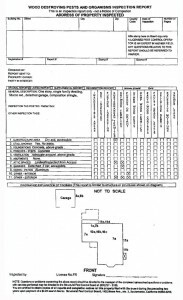 I’ve been wanting to post some samples of the old 8.5×14 WDO Termite Report for California from the past. After searching through some old files I happened to find a couple of examples. I removed all the personal information and company names so I could post these for your viewing pleasure. One of the main reasons that I wanted to post these was to show where the 1-11 area categories came from. Newer inspectors that work with companies that still categorize their reports by the old 1-11 system don’t realize why there are 11 areas of the property. 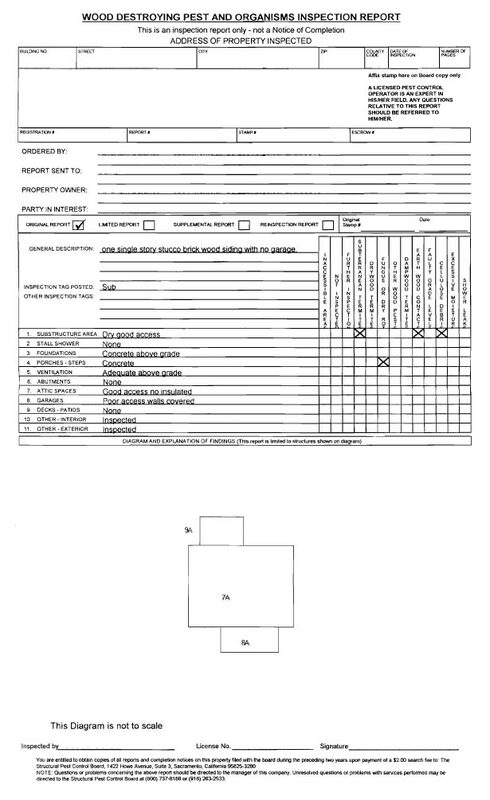 The reason is that the Structural Pest Control Board’s required form for many years specified the 11 areas and they had to be properly filled in on every report. This was back when the report was still tall enough at the 8.5×14 size. So what about termite report writing? Currently, Beevio is ready to go for 38 states and California is scheduled to be released in March 2013. If you love Bugbase, your going to flip for Beevio. If your in the market for California Termite Report Writing Software, hold on for about a month and call Aceapp for a demo and free trial. This is the next generation mobile termite report app that’s going to change the way termite reports are written and delivered. 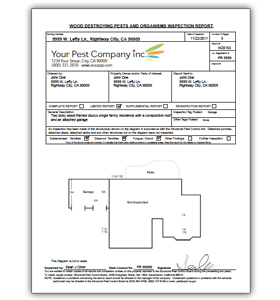 The common name for a WDO Report in California with consumers is “Termite Report”. Home owners ask for a termite inspection when they call for service but they are going to get more than just a termite inspection in California. WDO is short for “Wood Destroying Pests and Organisms” or “Wood Destroying Organisms”. Inspectors are required by law to report all WDO findings noted during their inspection not just termites. Some of the other findings that will be included are wood destroying fungus, dry-rot, powder post beetles, carpenter ants, carpenter bees, termite damage, and anything that may lead to a WDO infestation or simply the signs of something that may need to be further investigated. An inspector can limit the report to a specific area of the property if requested by the person ordering the report. Let’s say that the owner of the property has requested that they only want the exterior living room bay window inspected because they see some termite dropping on the window sill outside. When the inspector arrives he confirms a drywood termite infestation but in the same window he sees dry-rot and fungus. He must report all the findings not just the termite infestation that the home owner called about. A home owner can request the report to be limited to an area but not limited to a specific type of infestation. What’s next for termite report writing? All digital and paperless systems are coming and some software developers are experimenting with the technology at this time. Inspectors will carry a mobile device during the inspection to note their findings and diagram the property. Inspectors will then be able to use that data to create an actual termite report and e-mail the report to the customer while still at the property. You would think that everyone would be using handheld devices to write termite reports by now but the technology still is not quite ready. There are several hurdles to overcome before it becomes the industry standard to use a mobile device to write your termite inspection report in the field. Cost of mobile devices and software, cost of mobile internet access and lack of full coverage for all areas, and software that is designed specifically for inspectors making field reports is still not quite ready. If using a mobile device to write termite reports is not faster and easier than quickly sketching a drawing and making your chicken scratch notes all over the field sheet then inspectors are going to be reluctant to change. When the technology is ready I believe the first users will be small companies where the inspector is the owner of the company. They will see the value in overcoming the learning curve and use the technology to have an edge over their larger competitors that aren’t ready to jump into the future. We are still about 5 years away from having everything in place to make this a reality and 10 years away from it being so common that all inspectors will reminisce about the old days when you used to hand write termite reports and then take them back to the office to generate a report. A separated report is a variation of the standard report types. Separated termite reports are generally issued for escrow reports and help define what is currently a problem and what may lead to a future problem. This information is used in the negotiation process between buyers and sellers. Also, most lenders will require that all Section I Findings and Recommendations be completed in order to fund the loan. Each finding and recommendation in the termite report needs to be labeled either Section I, Section II. If the item is a recommendation for Further Inspection then the Section is Unknown. 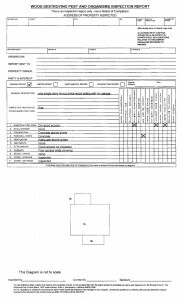 Inspectors need to be expert termite report writers in order to accurately label each finding. Many findings can be classified as either Section I or Section II depending on the situation. Example: A common finding is Cellulose Debris in the substructure. This is simply loose cellulose material like wood or cardboard laying on the ground in the substructure of the home. Cellulose Debris would generally be a Section II item because if it is not remove it will make it easier for a Subterranean Termite infestation to develop. However, if the Cellulose Debris are full of active Subterranean Termite infestations then you should classify the item as Section I. Is there something different about inspection reports for an escrow? If you ask most inspectors they will tell you yes. In truth, they are no different than any other report. The Structural Pest Control Board of California doesn’t make a distinction. However, there is something that sets the escrow inspection apart, liability and lots of it. The reason for more liability is that property buyers are looking at the report as a professional opinion about the condition of the property even if you are not hired to complete any work. Example: Let’s say a Realtor contacts a termite company for a free inspection on their listing of an older home. 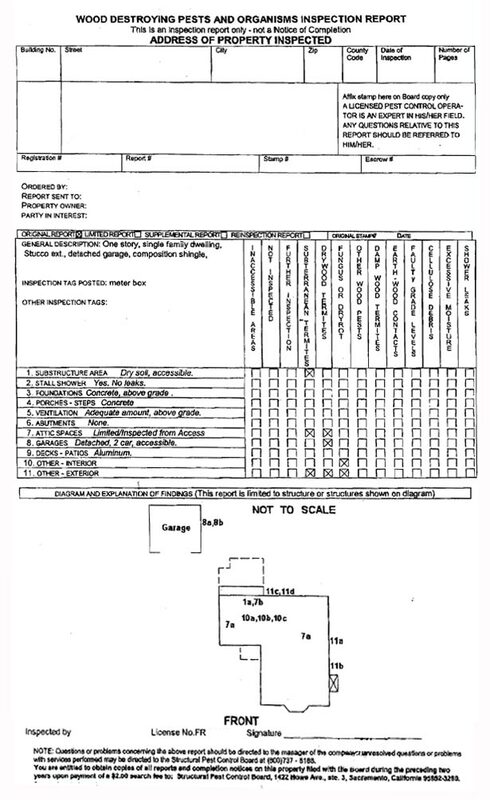 The termite company sends out an inspector that rushes through the inspection and he misses that fact that part of the house is an un-permitted add on and there is no concrete in the foundation. Just wood sitting on the ground. An investor buys the home with cash and bypasses lending requirements. His offer on the house is based on the termite companies report of findings and estimated cost of corrective measures. While renovating the home for flipping, the new owner discovers the foundation problem and suddenly finds out that he needs to install a foundation and get the city involved in his quick flip. His profit has just vanished and he may loose money by the time he corrects all the problems and sells the property. In this case, you can bet the new owner will be coming back to the termite company to fix the foundation problem for free. In this case, it doesn’t matter that the termite company never charged a dime for their report and was never hired to do any corrective work. The structural pest control board will hold the termite company responsible for what they missed with a poor inspection and so will most courts. Termite companies don’t even realize the level of liability they undertake every time they issue a termite report for an escrow until they get hit with a huge bill from a buyer and go through the process of trying to fight with an unhappy property owner and the Structural Pest Control Board about their liability. In Southern California the majority of termite companies give escrow inspections for free to try and stay competitive. It would be wise to charge for escrow inspections and take the time needed to do a thorough and professional report. California Termite Reports – The Old Days. We’ve come a long way since the days of typing termite reports on an actual typewriter. Back in the 70s you would put a 5 layer carbon paper stack in the typewriter and hand type out entire reports. 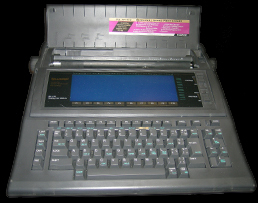 In the early 80s you would still used the 5 layer carbon stacks but at least a typewriter / word processor that could be programmed to automatically type out a few sentences of text by entering a short cut code. Fixing typing errors was a nightmare and I knew there had to be a better way. Unfortunately the cost of early computers were outrageous. Not to mention if you could afford a pc, there was no software solutions for typing California termite reports. Once programs like Bugbase came out, everything changed for the better. You could now store an unlimited number of findings and recommendations, easily customize them for each report and reprint full reports with a simple click. Technology has changed the way termite reports are written for the better. No more carbon copies and almost no more faxing with the addition of PDFs and e-mail. What’s next?